The SILVIA Project is using Autobiographical methods as a way to reach our target group of women and adult volunteers. River of life is a visual method that helps people tell stories of the past, present and future. Individuals can use this method to introduce themselves in a fun and descriptive way; a group can use it to understand and reflect on the past and imagine the future of a project; and it can be used to build a shared view compiled of different and perhaps differing perspectives. River of Life focuses on drawing rather than text, making it useful in groups that do not share a language. When used in a group, it is an active method, good for engaging people. – Did you use this right when it was put in place? -Which rights have impacted you the most? Participants can then place post it notes on the timeline with accounts of when the used this right. E.g in 1999 I first went to the doctors and received free contraceptive pills. 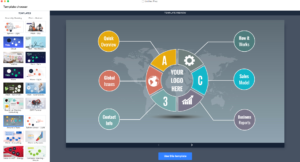 Prezi is a presentation tool that can be used as an alternative to traditional slide making programs such as PowerPoint. Instead of slides, Prezi makes use of one large canvas that allows you to pan and zoom to various parts of the canvas and emphasize the ideas presented there.